Technofast’s CamNut EziJac system brings a cost effective and efficient solution, in a compact system which is simple, safe and easy to use. Bolt Tensioning tools are designed to pull on the bolt threads protruding above a regular Hex Nut. They are then screwed down to retain the load brought about by the hydraulic operation of the tool. 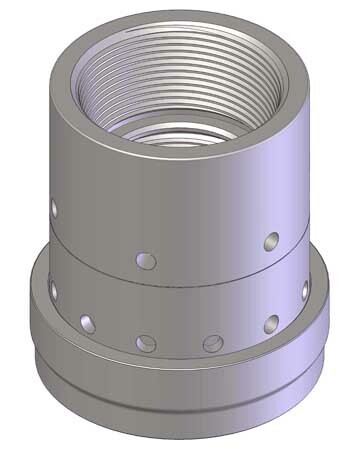 In those instances where there is not enough remaining thread to “grab hold of”, the CamNut acts a connection to the bolt for the application. Its integral collar expands to take up the bolt’s elongation under force and retains the load when the hydraulic charging pressure is released. User friendly, fast to fit and remove. Requires little physical effort from operator. Quick connection from Nut to Tensioner. Ideal for situations with a short bolt grip length. Modular construction reduces overall tool weight. No longer a need to replace expensive studs to provide sufficient grip length for Bolt Tensioning. Designed for extreme situations/adverse conditions. Pressure Vessel Closure (Autoclaves, Boilers etc).